It's the kind of one-word brand that a creative dreams of. Treasured by its followers, envied by its neighbors. World renown as a skier's cult-status hero, Alta is located 12 miles up the canyon from Salt Lake City's Olympic majesty. Joined at the hip with its closest neighbor Snowbird, Alta, while smaller, is widely venerated as superior. Alta. Now a Trampoline client. It's August. Things at 196 Glen have been humming along since Memorial Day. New hires and exits, interns and sunburns. Web sites, retail packaging projects, capital campaigns, identity development and, of course, pro-bono work. It was high time to take a much-needed break, and we had just the place. The Sacandaga Outdoor Center is located at the confluence of the Sacandaga and Hudson Rivers. Put another way, it's where the Sacandaga meets the Hudson. —But then, one wants to use the word confluence as often as one can. So we'll stick to that description. For rafting, tubing and kayaking, this is the finest spot in the northeast, and while there are several Rafting outfits in the area, SOC is, by far, the best. Trampoline has proudly called owner John Duncan and family a client for three+ years. Shoving-off into the white waters of the Sacandaga River is a little like being at the crest of a long roller coaster climb. By the time the raft is assaulted by first wave of rapids, everyone is thankful to be soaked—because they've pretty much wet themselves already. It's completely safe...it just doesn't feel safe. Or like anything remotely close to safety. Guests are battered by spray, drenched by walls of water, commanded by seasoned guides, spun like a top and narrowly miss dozens of VW-sized boulders. For some reason, rafters at SOC are smiling, all the way down. Thanks to John and Co. for making this summer's Trampoline picnic a memorable one. We definitely Enjoyed The Ride. At the shop, Johnny D and Jess Duncan—known on the river as No Fear and Sneak, respectively—reassure Julia and Ben Slayton that they're about to have the time of their lives. Several minutes later, at the put-in, Julia and Ben are still wary, and Raeanne appears to be having second thoughts, too. Turns out, they had good reason for concern. The Magees stayed on dry land with a crew too young to take to the rapids. But the scenery was nice, and the Hadley railroad trestle is always picturesque. It's a special group here at Trampoline. Creativity: Not well applied to rafting. Briar and Raeanne meet over strawberries. Thanks to the staff for a great time, and a marvelous third quarter. Go Team Trampoline! Derek and Sean made another appearance in Bolton Landing, this week, this time crossing the bridge to Green Island, home to the Sagamore. This historic (and breathtaking) lakeside resort turned to Trampoline to help market their thanksgiving, holiday and New Year's Eve Resort Packages. Considering how the Old Girl twinkles with a little snow on the ground, it should be a pretty easy sell. When that winter wind starts to nip, where would you rather be but curled up by a roaring fire in the very finest Adirondack accommodations? Derek snaps a shot of the cupola. The workbench that was 14 months in the making*, is finally...finished. A few months after construction was competed on Chateau Slayton, a big storm ripped down the leeward side of West Mountain, leaving a swath of felled maples in its path. After a Trampoline budgetary meeting over microbrews at the house (customary), we wandered up to the treeline to marvel at the damage. "Don't chop those up" one of us suggested to the other. "They're pretty straight. Might make good legs for a workbench in your garage." Now it might sound like we're channeling Duncan Kincaid, but we ARE in the Adirondacks, here, and the subject of the conversation was a rough-cut workbench, after all. We put it off for as long as we possibly could, until Paula and Amanda hatched a plan to put both Derek and Sean in the Slayton garage with a pile of lumber and some power tools. Leave it to them to find a way to get it done. Thanks, ladies. * We didn't spend 14 months building it. We spent 14 months talking about building it. The week hit a high-note Monday afternoon as Raeanne and Sean headed up to the Marcella Sembrich Opera Museum for a tour and a TestBounce™ with the Board. Five acres of take-your-breath-away lakefront and a waterfront villa that's on the National Register of Historic Places. Sembrich was the definition of fame and talent in her day, and her former studio, off Lakeshore Drive in Bolton—home to the Museum's collection—is appropriately opulent. Her Steinway is surrounded by beautifully framed production shots, and hand-written notes from the likes of Brahms and Rachmaninoff. Even with all that history, music and culture surrounding us, nothing has quite the stopping power of Lake George on a perfect August afternoon. Raeanne gets a ruff greeting. A TestBounce can help get your ducks in a row. The photo and entry below showed up on the Bedlam Farm Blog—the online home of New York Times Bestselling Author, Jon Katz. He's a true creative whose enthusiasm for our business and the services we provide all but matches our own. Thanks for the kind words, Jon. "Being on a farm isn't just about hay and cows, thankfully. I get to wander off and meet some amazing people. This morning Anthony and I went to Trampoline Design in Glens Falls to discuss various creative matters - his company brochures and advertising campaign, the posters for the Art Harvest at Gardenworks in October. Trampoline is one of my favorite places, a sort of contemporary identify machine, where they design logos (mine on this page), websites, marketing campaigns and other things relating to finding identity and sending classy messages and signals to the world. 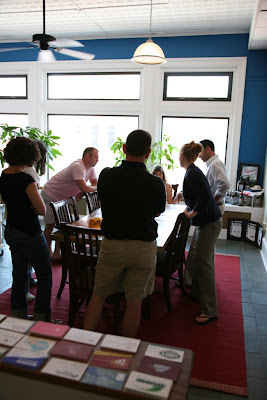 I love the way the staff all meet, all of them gathered around to toss around and absorb ideas, all encouraged to think for themselves, not to worry about the boss (or the client, either). The place and the people have a great identity, a creative one, that is infectious. They are now mulling a poster for the art show, rejecting my ideas and pictures, making me go back and take more, barnstorming for better ideas. I doubt they even know how much I love being around people like them. I doubt that they know this, as young people rarely do, but they evoke, for me, a lost time and ethos. I have to confess to a certain kind of snobbery in that I once thought creative young people like that were all in New York City or Boston or LA or San Francisco, but now, as with so many things I once believe, I see that isn't true. I don't want to leave these meetings, and I hate meetings. Tramp's cozy second floor offices in the middle of Glens Falls invoke a different time, when creative people were permitted to be creative, and wanted to be. They sure are. Talking to Sean, Amanda, Raeanne, Dylan, Trina and Derek is sort of a trek to a creative oasis, where nice tough people brainstorm in the truest sense of the word. They are great fun, quite refreshing. 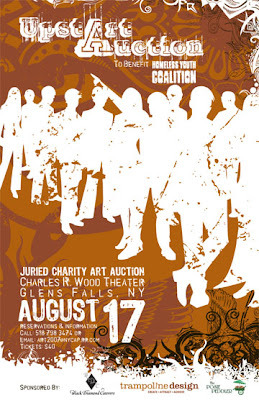 I trust them greatly, and hope they never get bigger.Can't wait to see what they come up with for the Art Harvest poster, and they sure don't take any stuff from me." Homeless shelters evoke strong emotions, largely from their mission and the faces of the people they serve, brand or marketing materials are rarely the first things that come to mind. It is in that void, that the Homeless Youth Coalition saw an opportunity to enhance their services: to create a mechanism to work harder, reach farther, and ultimately, to sustain hope. HYC, a local shelter for troubled and homeless youth of the north country, worked with us to come up with a “non-corporate” identity that would resound with its potential residents, and, in effect, save more lives. Trampoline recently completed a logo for the organization, as well as design and event marketing for their forthcoming “UpstART” artists show. 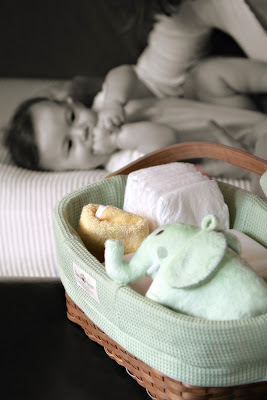 Babies & Baskets and BEARS- oh my! In anticipation of a big industry tradeshow event in Las Vegas, Trampoline has been working hard on packaging for SaraBear Baskets’ flagship product the SaraBear Basket Diaper Caddy. Sounds simple, but according to feedback from industry experts, hitting the retail shops could be a major step toward making this simple-yet-effective product a household name. Relying on first-hand experience, we donned bibs (over lunch) and got creative designing the packaging for the product. With autumn on the way, we’re expecting big things from this small package. 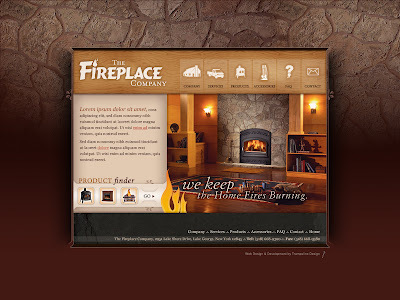 Summer is hot and so is the Fireplace Company. Not to be outdone by summer, Paul Chambers’ fast paced business just got hotter- or it’s about to. Trampoline is underway with a website redesign in order to update inventory, presentation and functionality. When we’re done cookin’, the forthcoming site will be a huge benefit to not only clients, but to the FPC’s online presence and brand positioning. We’ll keep you posted on a launch date. Poised with mouse in one hand and creative muse in the other, Trampoline Design’s newest addition, Raeanne Wright, is ready for action. In fact, we can’t keep up with her. A web designer and developer by trade, meticulously organized and creative by nature, Raeanne comes to us with a boatload of web, video and design experience- and it shows. She hasn’t wasted a minute and gone straight to several key projects currently in progress. Trampoline officially welcomes Raeanne to the staff. We’re excited. She’s excited. We can’t help but think our clients will be too.